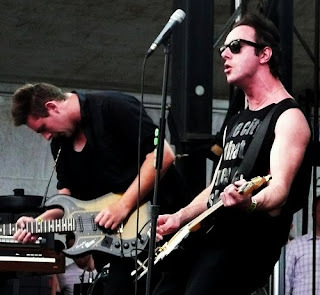 As day two at Lollapalooza marched on, Scottish act Glasvegas ushered in the evening with a set at 5:30 on the Vitamin Water Stage. The band's debut, self-titled album was a great combination of grit and Phil Spector-influenced melody, so I was definitely looking forward to seeing the band live. They wisely opened with their single "Geraldine," probably their greatest song. They hit on all the other highlights from the record, such as "Go Square Go" and "Daddy's Gone," and the material took on a harder, louder sound in the live setting. 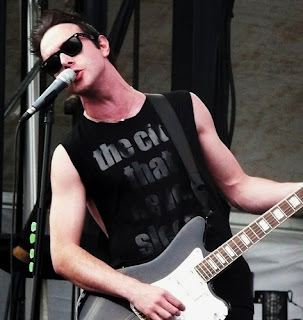 Unfortunately, front man James Allan created some unnecessary awkward moments by randomly making crude body part jokes in his stage banter and then apologizing for it later after realizing there were kids in attendance. Cringe-worthy moments aside, the set was pretty good. Later, opting for the Yeah Yeah Yeahs over the other headlining act, Tool, we made our way to the Budweiser Stage to catch the group's set, which started at 8:30. Per usual, front woman Karen O proved she was there to entertain by emerging in a very elaborate American Indian-meets-gigantic killer bird costume. While she didn't have much to say to the crowd, the band delivered a spot on set full of material from their latest, synth-heavy record It's Blitz! as well as a handful of favorites from earlier albums Fever to Tell and Show Your Bones. 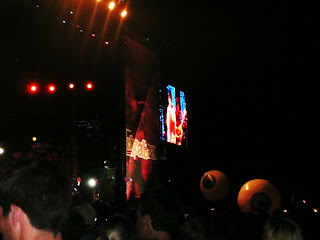 The best moment came when the band performed the single "Zero" and sent two giant eyeball beach balls into the audience. All in all, the Yeahs proved why they were a solid choice to headline in place of the Beastie Boys.